A friend and collaborator of mine, Terry Olesen of Australia, viewed the movie Bohemian Rhapsody, which is about the rock band Queen. Afterwards, Terry had the spontaneous intuition that Freddie Mercury, the songwriter and lead singer of Queen, was the “reincarnation of Tagore.” At the time Terry knew little about Rabindranath Tagore, only that he had been a poet from the country of Bengal. Further evaluation revealed that the facial features of Tagore and Mercury are consistent, talents are similar and that this appeared to be a plausible reincarnation match. In a subsequent session with Kevin Ryerson, Ahtun Re, the Egyptian spirit guide channeled through Kevin who has demonstrated the ability to make past life matches with a high degree of accuracy, affirmed that Freddie Mercury is indeed the reincarnation of Rabindranath Tagore. In addition, Tagore was a prolific composer and wrote over 2000 songs. Two of his songs were selected to be national anthems, those of Sri Lanka and Bangladesh. Tagore died in 1941, in the city of his birth, Kolkata. Freddie Mercury was born in 1946, 5 years after Tagore died. Though Mercury is known as a British singer-songwriter, he was actually born in Africa to parents of Persian (Iranian) ancestry who had been born in India. Upon his birth, Freddie Mercury was given the name of Farrokh Bulsara. He grew up in Africa and then, when his parents returned to their country of birth, he lived in India. When Farrokh was in his late teens, his family moved to England. When he was 24 years of age, he formed the rock band Queen, along with guitarist Brian May and drummer Roger Taylor. Farrokh Bulsara, at this time, took on the stage name Freddie Mercury. Freddie Mercury, like Tagore, was a prolific songwriter and wrote the majority of Queen’s hits. Also, like Tagore, Mercury’s songs, such as We Are the Champions, have an anthem-like quality. The movie about Queen, Bohemian Rhapsody, was released in November 2018 and became the highest-grossing musical biographical film of all time. Freddie Mercury was bisexual and died of AIDS in November 1991. Tagore had been married to a woman and had several children. 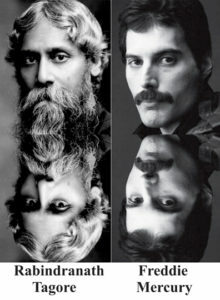 Physical Resemblance in Reincarnation Cases: The facial features of Rabindranath Tagore and Freddie Mercury are consistent. Past Life Talent: Rabindranath Tagore’s talents as a songwriter and singer appear in the career of Freddie Mercury. Change of Nationality and Ethnic Affiliation: Rabindranath Tagore was Bengali, while Freddie Mercury was born in Africa to parents of Persian ancestry, who had been born in India. Freddie moved to England as a teenager and is know to the world as a British rock star.